It has been a while since I picked up some historical fiction. I usually go for books like this in the autumn, especially given the beautiful cover design that this one has. However, I didn't get around to this until the beginning of January but I flew through it because I found it so interesting. The setting of Gawthorpe Hall and the surround areas was pretty magical and I enjoyed the description of such places. I loved the character of Fleetwood Shuttleworth. I really connected with her as a character and found myself routing for her from the very beginning. I was glad to see that she was quite headstrong, bold and brave considering her position and her health. It's so nice when you feel that emotional connection with a main character in a book because you want what's best for them and for them to succeed in whatever it is they are working towards. I also enjoyed reading about Alice Gray. She had a very interesting story and I like that she seemed unreliable and untrustworthy at times because it made you want to keep going to find out who she really was. The writing style is very addictive. Stacey Halls has a really magical way of writing that just made me want to keep going. There were numerous times that I struggled to put the book down. It definitely had that "I know it's late, but just one more chapter" feeling for me, and before I knew it, most of the time, I had read six more chapters and it was one in the morning! Overall, I really enjoyed this book. I felt for the characters and I really enjoyed going back to a book that involved witchcraft and trials. This area of history has fascinated me since I read The Crucible as a teenager, and it has made me want to reread it again as well as look for other books that focus on this topic. Stacey Halls has done a phenomenal job with this book and I look forward to whatever she may bring out next. 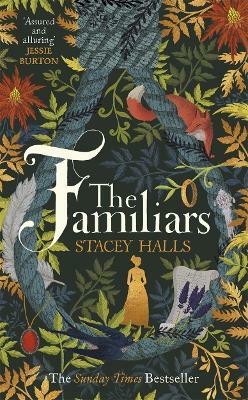 The Familiars is richly atmospheric, conjuring up the feel of the early seventeenth century with ease. Using the Pendle witch investigations as its inspiration, it approaches the story from a new and insightful angle – through the eyes of a spirited young woman straining against the restrictions of her class and gender who befriends one of the women caught up in the accusations. The very real sense of peril for women at this time comes through clearly, and there’s enough of a layer of doubt over whether there’s any supernatural activity going on to keep you questioning. Perfect for fans of The Witchfinder’s Sister and The Crimson Ribbon.